which is currently at 621 Gallery in Rail Road Square. This show features new works by FSU Professors Messersmith, Garcia-Roig and Professor Emeritus Burggraf. While this show is similar in spirit to the original in 2004, all the works are in this exhibit are new, bigger and bolder (some even move!) and we think it is an awesome show. 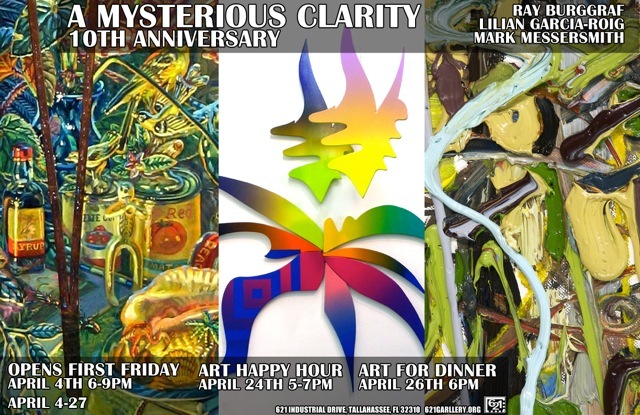 The laid back ART HAPPY HOUR on THURSDAY, APRIL 24 is from 5-7 & will be the last opportunity to visit with artists while the show is still up. All three artist will give short talks during the happy hour.